For their upcoming 10th anniversary season, the Rapid City Rush will now serve as the proud ECHL affiliate of the NHL’s Minnesota Wild. 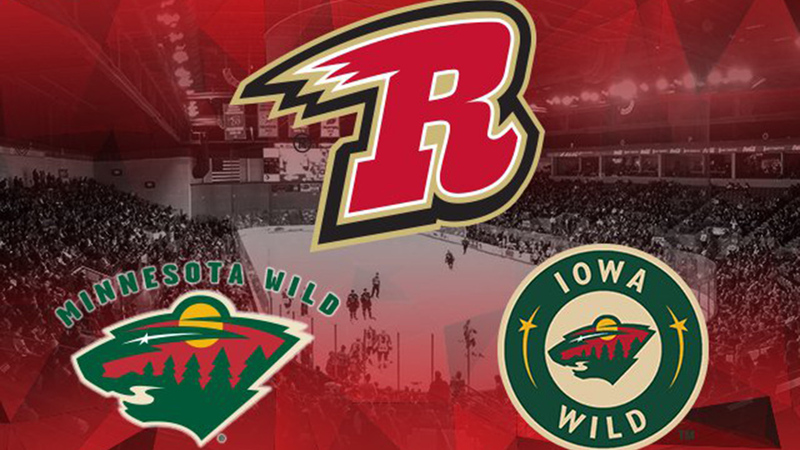 RAPID CITY, SD — For their upcoming 10th anniversary season, the Rapid City Rush will now serve as the proud ECHL affiliate of the NHL’s Minnesota Wild. “This is a very important day for the Rush organization as we enter into our 10th anniversary season. We are thrilled to announce that the Rush has entered into an agreement to serve as the exclusive ECHL affiliate of the NHL’s Minnesota Wild and AHL’s Iowa Wild,” said Rush General Manager, Joe Ferras. “The Wild have a tremendous fan base in Rapid City and in the state of South Dakota, so we know this will be great for our loyal fans and corporate partners as they watch their favorite NHL team’s prospects develop through the Rush organization in the hopes that they achieve their ultimate goal to play in the NHL with the Wild. The Minnesota Wild is a thriving National Hockey League (NHL) franchise that began play in 2000. Its parent company, Minnesota Sports & Entertainment (MSE), is a premier sports and entertainment provider with several different avenues of business operations headquartered in downtown Saint Paul, Minn. Its subsidiary, the Saint Paul Arena Company, manages the state-of-the art Xcel Energy Center, home ice of the Wild, and the Saint Paul RiverCentre, which includes the Legendary Roy Wilkins Auditorium. MSE also owns the Iowa Wild franchise in the American Hockey League (AHL), the primary development affiliate of the Minnesota Wild based in Des Moines, Iowa. Driven by a mission to “Create a Greater State of Hockey,” MSE and the Minnesota Wild Foundation also strongly support community causes, primarily in the area of pediatric giving. Tomorrow [June 20th], the Rush will announce their first player of the offseason! Tune in tomorrow afternoon to hear who will don the Rush “R” next year and represent the Black Hills in our 10th anniversary season! What are your thoughts on this new affiliation? Leave your thoughts in the comments section below.